With Disney Cruise Line’s new plan to introduce a “Beauty and the Beast” production aboard the Disney Dream, each ship in the fleet will have a unique stage show based solely on a singular animated film by Nov. 6, 2017. Over the last several years, Disney has been rolling out new one-off production shows onto its ships following the introduction of “Disney’s Aladdin – A Musical Spectacular” exclusively aboard the Disney Fantasy, when it first launched in 2012. Back then, the Fantasy was looking to add shows to the lineup from sister ship Disney Dream since the then-new ship would be embarking on longer weeklong sailings versus the shorter three- and four-night ones on the Dream. In fact, other revue-style stage shows, still with a narrative tying musical medleys together, exist on the line across several ships such as “The Golden Mickeys” on the Disney Dream and Disney Wonder, “Disney Dreams – An Enchanted Classic” on the Disney Magic and Disney Wonder, “Twice Charmed: An Original Twist on the Cinderella Story” on the Disney Magic and “Villains Tonight!” on the Disney Dream. 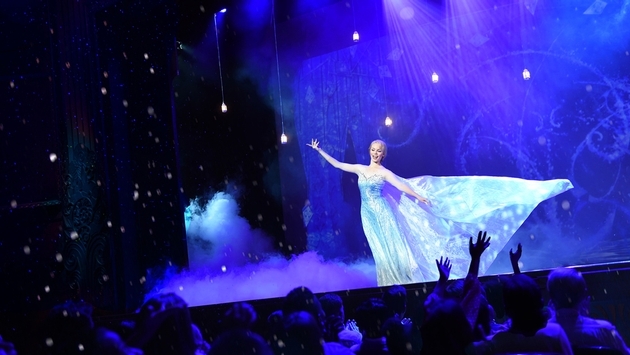 Elevating the entertainment experience more recently have been “Tangled: The Musical,” which debuted on the Disney Magic in November 2015, and “Frozen, A Musical Spectacular” which was just introduced on the Disney Wonder in November 2016. Those keeping track will realize that this coming November will mark the third straight year that the month has marked the unveiling of a new Disney Cruise Line show. Of those currently running, “Tangled” is the only one I have yet to personally see, but based on my experience watching both “Aladdin” and “Frozen,” I have high hopes for “Beauty and the Beast.” After all when the cruise line has access to master composer Alan Menken who wrote the music for all four of the original animated films save for “Frozen,” there’s all the reason needed to reinterpret the films at sea. Of course, “Beauty and the Beast” is also a pertinent one since it will coincide closely with the premier of the highly anticipated live-action film version coming out this March. A number of these stories have already existed on a Broadway or theme park stage before, but cruise ships offer particular challenges in remounting them. Most notably is that the theaters, stages and backstages at sea are considerably smaller, but that has led to some creative solutions as well. Disney has become a master at puppetry to represent characters at different ages or moments during their story arcs, which has allowed the cast of singers and dancers to remain compact. Although, it’s still one of the largest stage companies on a ship. Future films on the Walt Disney Animation Studios slate to be considered also include “Wreck-It Ralph 2” and “Gigantic,” the company’s take on “Jack and the Beanstalk.” Until then, though, we still have plenty of great shows to enjoy onboard.